I was super stoked about this Valentine’s Day recipe because it looked so fun and easy, but then when I saw how bright pink it became, I got a little nervous. Pink is my least favorite color so I literally almost threw it in the trash and stopped the whole production. GOOD THING IT DIDNT! I brought my treats to my buddies at Chapman News (and seriously debated whether or not I should bring in this hot pink disaster) and guess which one was their favorite? Yep. This one. I was seriously shocked. These blondies were gone before my Red Velvet Brownies!! This is Michael eating my blondies. He said they tasted like Pop Tarts but 10 times better. You can even make these in a little heart shaped pan to go with the occasion. Confession Session: I actually only have one 9×13 pan and my Red Velvet Brownies were in them, so I had no option but to use this pan, but hey, it works! Without further ado, please enjoy this quick, simple, delightful recipe. 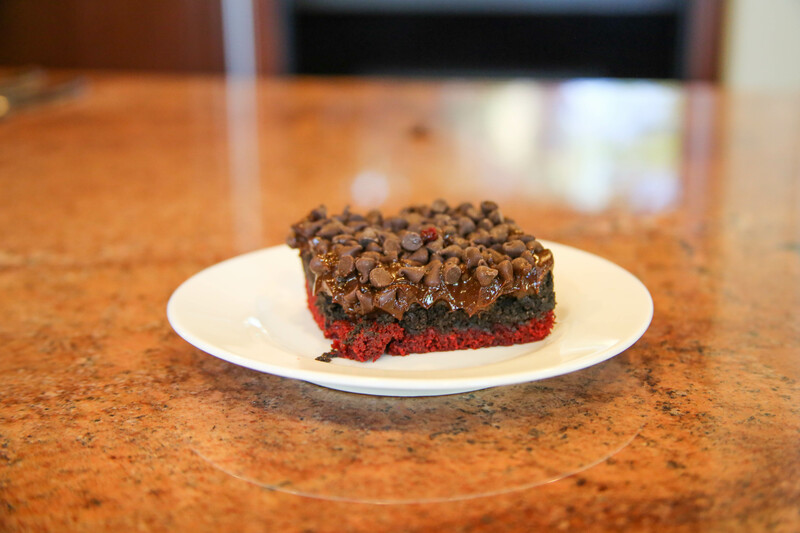 Share with your friends and subscribe to my YouTube channel for more baking videos! In a bowl mix cake mix, oil, egg and milk together. Bake for about 17 minutes or until slightly golden brown. Microwave remaining white chocolate chips in a bowl until smooth and melted. Dribble over the top of the blondies. Cut or just dig in with a fork! Enjoy!